What's so interesting about a pair of completely purple gloves, you ask? Why, just look at how fabulous they are! Purple can go with so many different colors including gold, red, yellow, and even some browns! They take some ordinary outfit and add a crazy blast of dark, yet shiny color like no other! These guys also have awesome uses for Halloween, you can trust us on that. 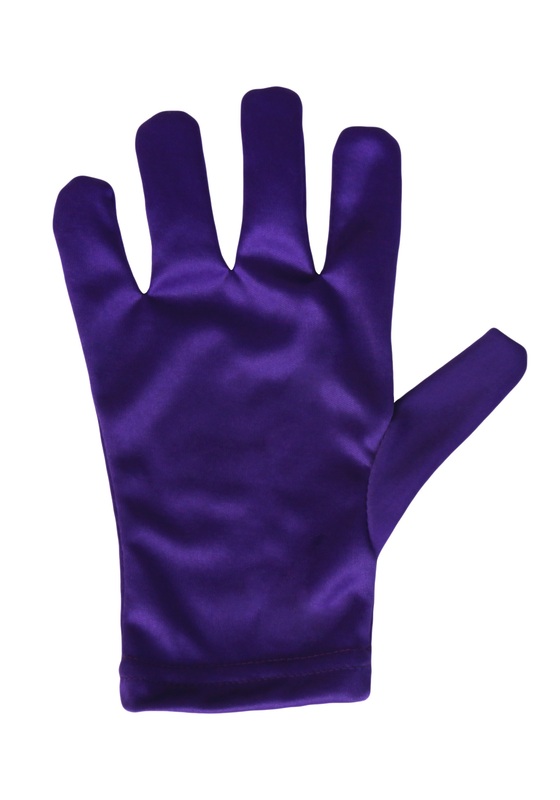 Finish of a grape costume by covering your hands with this color or create your very own purple power superhero! We have a bunch of purple morph suits too that would go great with this accessory. Your child is going to love running around with these during the trick or treating festivities or just adding it to their dress up wardrobe so they can make up their own costume accessorizing ideas. Be sure to check out our other colors of gloves for the rest of the rainbow. It is really small, I ordered large child Jocker costume that fit good my 10 years old boy but there's only one size of glove, very very small ( would be ok for 4 years old). We buy also the same glove for adult, that fit medium women size so ok for my boy.